COEP RSC: BY THE POWER OF DEADSHOT - Robolab Technologies Pvt. Ltd.
Deadshot looks more like a portable table than a highly advanced robot. Its metal frame fitted with wires, motors, and sensors only accentuate its odd appearance. Yet, beneath the haphazard network of cables, lies a champion bot that can toss a frisbeeshaped disc and make it land on designated targets with pinpoint accuracy. In fact, Deadshot is so accomplished at the task, he beat others like him in the national finals of Robocon, a robotics competition organised three months ago in the city. The bot now trains at an indoor badminton court in the College of Engineering Pune (CoEP) campus with the perseverance of an Olympian athlete. Preparations are on for the Asia- Pacific Robot Contest (ABU Robocon), scheduled to take place in Japan two months from now. 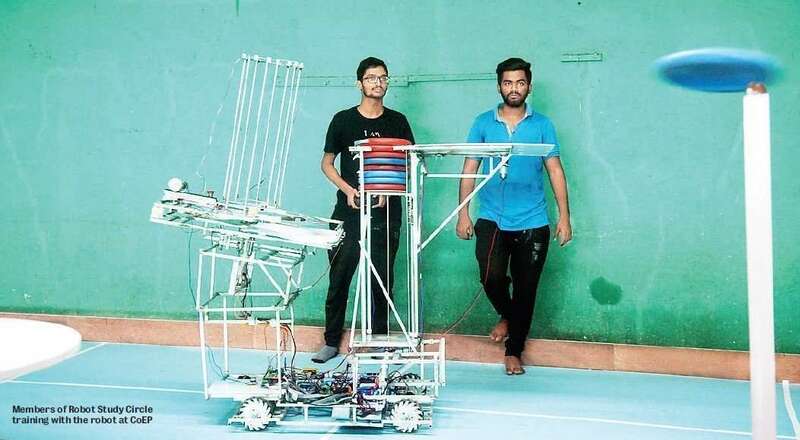 Deadshot is put to work by two CoEP students — 22-yearold Shubham Sonawane is the primary operator and 21-year-old Shivam Thabe is the secondary operator. Their job is to ensure the robot fires the foam discs with right velocity. “We practise with Deadshot from 2 pm to 3 am to perfect our timing,” says Thabe. Robocon’s theme this year is The Landing Disc. Teams get three minutes to land 50 discs on seven poles of varying height. The poles have a flat surface at the top on which a ball is placed. In addition to executing a flawless touchdown, the operators have to ensure the disc displaces the ball upon landing. Simultaneously, teams try to knock off one another’s airborne discs, midflight. “Technical skills apart, we also need to develop presence of mind,” says Thabe. They have to train diligently to compete against robotics teams from China and Japan. Deadshot won the Robocon national finals by completing its task in over a minute. “But that is not good enough. Chinese and Japanese teams are known to cruise through the contest in 40 seconds,” says Sonawane. Both operators are members of CoEP’s Robot Study Circle (RSC). This is the first time RSC has won a berth to represent India in an international robotics competition such as ABU Robocon. Like all machines, the bot too is susceptible to breakdowns. A circuit might burn or one of its wheels can get jammed. So RSC members are also expected to be hands-on mechanics. But the bot did not show any signs of wear and tear as it moved around the badminton court like a Mars rover. Using a gaming controller, Sonawane demonstrates how the bot works. At its base, Deadshot has a display panel that flashes the speed at which the disc is launched. The velocity can be controlled depending on how far the disc has to travel. “It can toss a disc upto 400 centimetres per second,” says Sonawane. Deadshot is engineered with parts that have fancy names. A servomotor assists the bot to move its arm-like appendage. Earlier, it relied on pneumatic technology to move its curved limb. “The bot used to make a noise similar to a rifle shot when we only relied on pneumatics to launch the discs. That’s how it got its name, Deadshot,” says Thabe. Comparatively, Chinese, Japanese, and Vietnamese robots are technologically far superior operating on sophisticated algorithms, says Sonawane. So even though Deadshot can tilt its table-top head to control the arc and angle of the disc when it is launched, it is still being calibrated. The RSC team watches videos online to learn what makes their competitors tick. It has taken time and effort to build Deadshot, says 21-year-old RSC coordinator, Aashish Sonawane. When training for Robocon started last year in August, the bot was still being designed. At RSC, building a robot is a collaborative process. Seniors and junior students divide responsibilities and team members are given specific roles depending on their specialisation. “We spend hours in the lab,” says Aashish, “Our parents don’t seem to understand why we are obsessed with robotics.” For the last three months, Aashish and his teammates have been striving to get Deadshot to operate on par with Chinese and Japanese bots. “We changed the robot’s mechanism several times to make it work efficiently,” adds Aashish.